A schedule for the President’s land education campaign released by State House. State House picture. JINJA–Government has the right to use land for development purposes upon fair compensation, President Yoweri Museveni has said. 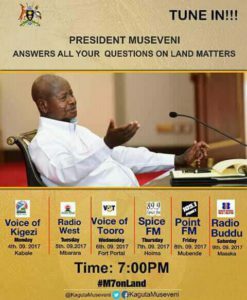 President Museveni was appearing on Baba FM, a local radio station in Jinja on Tuesday night, as part of his countrywide radio talkshows aimed at sensitizing the public about land matters. Baba FM is owned by Jinja Municipality West MP Moses Grace Balyeku. “Government can use the land for development after the government Chief Valuer has determined the price,” he said. The President also castigated what he called unscrupulous politicians bent on sabotaging government programmes. He castigated government officials who, by virtue of their positions, knew of government plans on the establishment of development projects, went and bought land cheaply and afterwards demanded huge compensation. On the issues affecting Busoga sub-region, the President said government is in the process of enacting a sugar policy that will prohibit individuals with less than five acres of land from growing sugar cane. “Those that have more than 6 acres of land will be allowed to practice the four-acre model of producing fruits, tending to grass for dairy purposes, coffee as well as food cultivation so that they use the remaining two acres for sugarcane growing,” the President said. He urged the Basoga not to emulate the people of Northern Uganda, who he said, are blocking development projects in their area. “In Amuru district, Madhavani wanted to start a sugar factory but it is ten years now and nothing has happened. The people that are poor are the ones fighting the establishment of these factories,” Museveni said. He also informed the people of the government intentions to start irrigation projects, like the one in Doho, in order to fight drought in the country. He also urged them to protect the environment and ensure that the swamps are not destroyed. “The issue is not chasing people out of the swamps because my father and I used swamps to feed our cattle. The issue is the way the swamps are used,” he said. The President also promised the people of Busoga that government has plans of tarmacking the main five remaining roads in their sub-region including Jinja – Budondo; Kamuli – Kyoga; Iganga – Luuka and Kaliro – Kamuli roads.